I'm almost back from vacation, I swear. I have a brand spankin' new camera and can't wait to show you the new pictures I've taken. 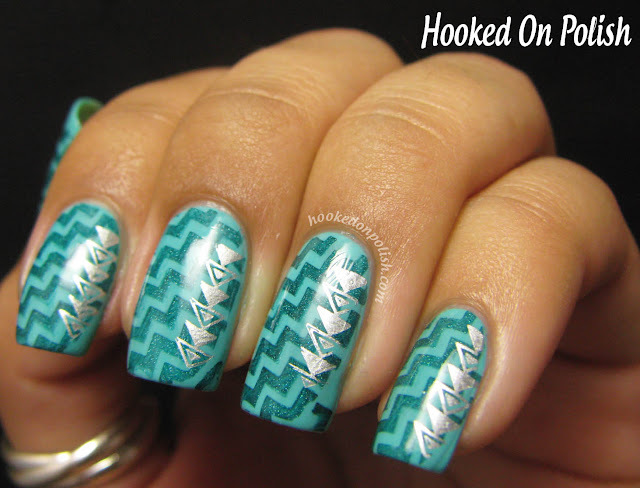 But I'm still unpacking so tonight I have a post by my pal Kat from Hooked on Polish. Not only does she have a wicked sense of humor that I thoroughly enjoy, but she also has fantastic pictures of polishes and nail art. My name is Kat and I run stuff over at Hooked On Polish and I'm extremely enthusiastic and anxious about being here today. Mimi's was one of the first blogs I read that also had beauty reviews and EOTD/FOTD so she definitely fueled my current makeup addiction, plus she's so annoyingly talented at DIY crafts, jewelry, nail art, etc. I even had a minor freak out on twitter and a girl said "just do something that represents your style!". Well, if you saw me walking around or asked anyone who knew me, you'd know I have no style. At all. I had a cool idea but it turned out to be a fail, so I went with stamping. You can never go wrong with stamping. Actually I take that back, you totally could. Anyway, I started with two coats of Essie Where's my Chauffeur? and stamped with a-England St. George and plate Mash-45. 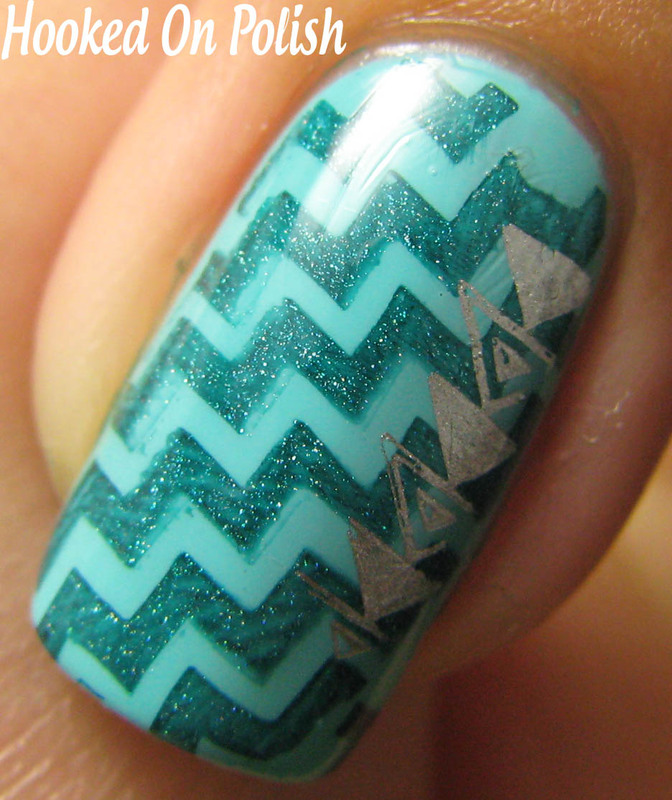 Then, because why not, I added a stamp from Mash-37 with Essie No Place Like Chrome. It's my first time using this stamp and I really like the results, it looked like a sticker. With some different color combos it could be quite an eye catcher. Not literally though.... I hope. Happy holidays and thank you to Mimi for having me! Super pretty manicure, no? Man, I haven't used my stamping plates in ages. Thank you so much Kat for that lovely post. Be sure to check out her blog and follow her!